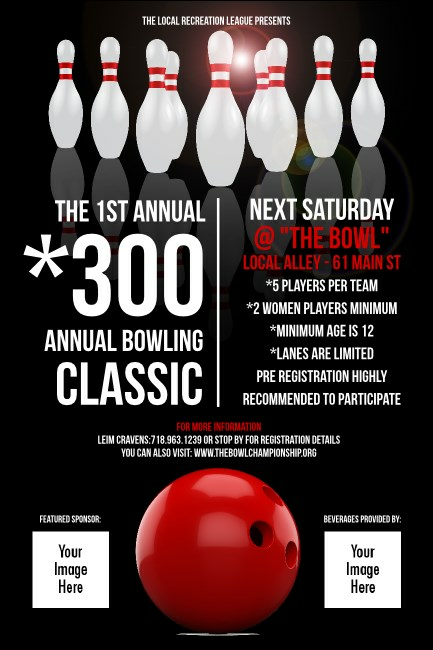 Roll out the perfect pre-event promotions for your event when you print Bowling Classic Posters and post them in advance. Each Poster gives you room to upload two of your own images on a classy black background contrasted by white pins and a cherry red bowling ball. Strike your sponsors’ fancy when you add their logos to your Poster templates. TicketPrinting.com helps you frame your promotions perfectly.